If you are looking for new patio furniture, lawn furniture or even a garden dining set, rattan garden furniture is a stylish, environmentally-friendly, affordable and durable option to consider. Actually, there is no question as to why rattan furniture sets are so popular around the world. 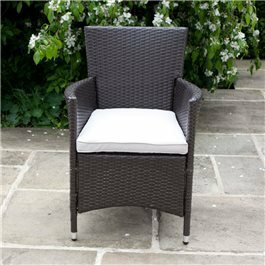 Garden rattan furniture is both easy to clean and maintain. Also, it is available in a variety of different shapes, sizes, colours including black, brown, white and grey rattan. As well as various designs from outdoor sofas to coffee tables. Not only does rattan garden furniture look good, it is perfect for both indoor and outdoor use as it is durable and heavy. BillyOh are proud to offer various types of rattan garden furniture. 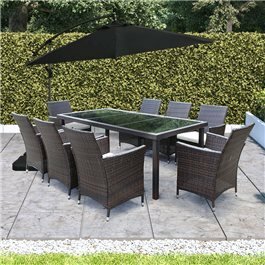 There is a rattan dining table and various sets available made to give you access to somewhere to sit and enjoy food with your friends and family during the warmer months. Alternatively, for a more modern look take a look at our rattan cube sets. Made from high-quality materials which are durable and long lasting, each rattan cube set comes with seat and back cushions to give you ultimate comfort when dining outdoors. On the other hand, if you are looking to get a glowing tan, relax in style on a rattan sun lounger. Furthermore, we understand that purchasing garden rattan furniture can get confusing. Therefore, we are dedicated to providing you with as much information as possible. In our blog we have many posts related to rattan garden furniture. For example, how to choose cheap rattan garden furniture. 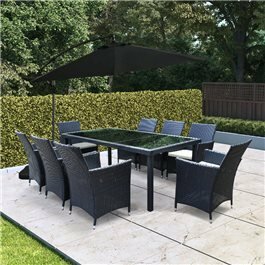 This blog outlines the best outdoor furniture for different occasions, from the best rattan furniture set to leave outside to the best set to seat the whole family, after reading this blog you should have a much better understanding of what you need. Additionally, you may still have questions even after purchasing the rattan furniture. What is the best way to store the furniture? How long is your rattan garden furniture likely to last? What are the most effective ways to care for rattan furniture? These are just a few of the many questions you may have regarding rattan garden furniture UK, and you may find the answers in our blog.Also why not learn from our customers directly via our customer stories? When you are looking for new patio or lawn furniture, rattan garden furniture is a stylish, environmentally-friendly, affordable, and durable option to consider. Rattan furniture is made of rattan, a palm plant which is found in parts of Southeast Asia. The unique growing patterns of rattan create gorgeous vine-like designs and patterns for a stylish and interesting look that no other material can compete with. There is no question why rattan is so widely popular around the world. Rattan furniture is easy to clean and maintain, coming in a variety of shapes, sizes, colours and designs. Rattan is perfect for indoor and outdoor use, but is especially useful as an outdoor seating option, since itâ€™s so durable and heavy duty. If youâ€™re looking for a stylish new addition for your yard, patio, deck, or pool area, rattan garden furniture is an attractive, comfortable, and aesthetically-pleasing option that friends, family and other guests will fall in love with. Plus, itâ€™s safe and durable for kids and all ages, so you donâ€™t have to worry about putting it away before the little ones head out to play in the yard. Even though rattan is a hugely popular choice for indoor and outdoor furnishings, many people donâ€™t know how rattan even came to be. Interestingly, history tells us that rattan has been used to produce furniture since the earliest days of humankind. Craftsmen used rattan to build household items such as baskets and other items. Modern rattan furniture was first developed by the Japanese, but is now widely popular throughout the world, especially in the U.K. and U.S. In fact, rattan is the longest-used natural fibre used to make furniture to this day. Many people believe that rattan furniture and wicker furniture are the same types of furniture, but there are some major differences between the two. Most importantly, wicker furniture is not always made of 100 percent rattan material. Rattan is the material used to make rattan garden furniture, but wicker furniture may be made out of materials other than rattan, such as cane, straw, bamboo, reed, or willow. Wicker is actually the weaving process, rather than the material. The two terms are often used interchangeably by many people, but they are not the same. Wicker is the process in which materials are weaved into furniture and rattan is a type of highly durable material that may be used to make wicker furniture. However, not all wicker furniture is made of rattan. Like bamboo, rattan is an environmentally-friendly option that it used to produce a wide variety of materials, including furniture, household items, kitchen supplies, and flooring. But unlike rattan, bamboo isnâ€™t as strong structurally. Bamboo is also more susceptible to water and moisture and it must be sealed. When it comes to outdoor furniture, rattan is the clearer choice. While rattan furniture looks absolutely beautiful inside of the home, the thing that makes rattan so wonderful for outdoor use is its incredible durability. Rattan is one of the strongest types of wood materials in the world, making it an excellent option for outdoor use. Additionally, rattan is easy to maintain, it looks stylish enough to transform any outdoor area, itâ€™s lightweight but also strong at the same time. Your outdoor furnishings should be inviting, comforting, and charming, which makes rattan furniture the perfect choice for creating a comfortable outdoor space that everyone can enjoy. Since rattan is so durable and sturdy, itâ€™s a great furniture option when you have children or little ones around. Rattan can withstand rough housing or heavy use. Itâ€™s safe for children to use, with no danger of it falling over or injuring them. One of the greatest benefits of rattan is that itâ€™s easy to clean and maintain. Other wood materials are difficult to care for, but rattan is just the opposite. Rattan is simple to wipe down and maintain and it takes up a very little amount of time to care for. Rattan needs to be thoroughly cleaned about once each year, but regular cleaning can be performed by wiping it down gently with a moistened rag or cloth. Gentle dish soap and liquid typically work just fine for this purpose. A toothbrush or small brush can also be used to remove dirt, if necessary. You should make sure that the furniture is completely dry before using cushions. About once per week, you should give your furniture a quick cleaning, especially if youâ€™re having guests over or plan to host a party or event. Cleaning your furniture shouldnâ€™t take up a lot of time and you should be careful not to oversaturate the furniture with water. Doing so could cause damage to the material. To easily clean your furniture, fill a bowl with water and add several drops of gentle dish soap to the bowl of water. Stir the mixture to create bubbles, and then dip your cloth or rag directly into the bubbles. You should avoid dipping the cloth into the water so you donâ€™t over-wet the furniture. Next, wipe the rattan clean with the bubbles, use a toothbrush or a small hand brush to clean the cracks or crevices. Again, make sure you only use the bubbles and not the water. When done, make sure you dry the furniture thoroughly. As we mentioned, rattan does need to be thoroughly cleaned about once per year. Even so, the cleaning process is simple. To thoroughly clean your rattan furniture, spray the furniture down with a solution of dish soap and water, then hose it down once again, removing all of the soap before drying it. Use a hairdryer to dry the chairs completely before returning the cushions to the furniture. If the sun is hot enough, you may also be able to dry the chairs by placing them in the sunlight to dry naturally. The furniture should be completely dried or mildew may start to develop. Once the furniture is completely dry, use a paintbrush to add a thin application of lacquer for added long term protection. If your furniture starts to fray or crack, you can help restore it by applying boiling linseed oil, then applying it to the rattan with a gentle brush. Wipe the furniture clean with a cloth and allow it to dry completely. Nobody likes hauling their heavy outdoor furniture indoors and back outdoors. Most types of outdoor furniture are heavy, bulky, and difficult to carry. However, rattan is lightweight and easy to transport. Itâ€™s hard to believe how durable rattan is when itâ€™s so light and easy to carry, but that is just one of the reasons why rattan is so great. Rattan is strong and perfect for outdoor use, but it feels nearly weightless, making it easy to move around the garden or even outdoor. Even the three-seater sofas are easy to move or relocate, reducing any risk of damaging the rattan. 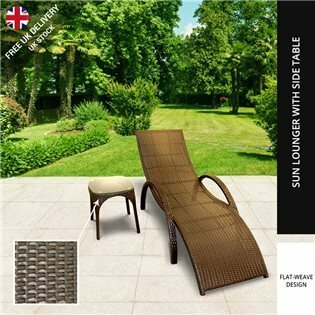 The look and feel of rattan is incredibly unique and interesting, especially in comparison to many other traditional types of garden furniture. The appearance of rattan appeals to many homeowners and guests alike. Rattan is very adaptable, making it easy to personalise to fit your style and interests. Rattan furniture pairs wonderfully next to gazebos, ponds, gardens, pools, decks, balconies, or anywhere you see fit. The placement of your rattan garden furniture is only limited by your imagination. 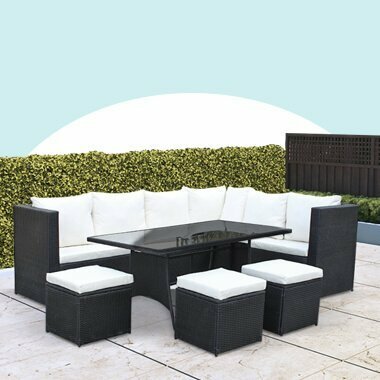 The furniture is great for transforming any outdoor living area, making it ideal for hosting parties, holidays, or events. Often, furniture that looks sophisticated is tough and uncomfortable to sit on. The only purpose it serves is to look attractive because itâ€™s not functional enough for daily use. Rattan, however, is both comfortable, functional, and classy. Just as rattan is often mistaken as wicker furniture, there are also synthetic forms of rattan on the market that lead to plenty of confusion amongst buyers. Synthetic rattan is actually rattan-effect furniture made out of plastic, polyrattan, or polythene and isnâ€™t authentic rattan material. However, synthetic rattan or rattan-effect furniture tends to hold up better for outdoor use. Natural rattan may attract mould if it gets wet on a regular basis, making it difficult to withstand the harsher climates of the U.K. Synthetic rattan, on the other hand, is much more weather-resistant than natural material. Plus, it often looks identical to natural rattan and is less expensive in the synthetic version. In addition to being stronger, synthetic rattan is also lighter than natural rattan, making it even easier to move around. Itâ€™s also very flexible and can be woven into different shapes and sizes for a beautiful, unique look. While some buyers prefer natural rattan to synthetic regarding matters of appearance, natural rattan can be coated with lacquer or water-sealant to make it more weatherproof. If you choose natural rattan over synthetic and plan to keep it outdoors, make sure you spray a thin coat of sealant to the furniture to ensure that the material lasts and does not fade. You can create the perfect outdoor escape by incorporating a full rattan set, complete with day beds,sectional sofas, tables, chairs, chaise lounges, and bistro sets. Instead of relaxing inside on a gorgeous summer day, take the whole family outside without having to sacrifice comfort. Sets are usually cheaper than purchasing each piece of furniture separately, so sets are something to look into if you plan to purchase more than one piece of furniture. Plus, sets guarantee that all of your furniture will match, since it can be difficult to find matching furniture when purchased individually. Rattan sets are typically available in sizes between two or three, or as many as twenty. In larger sets, various types of furniture are usually included. 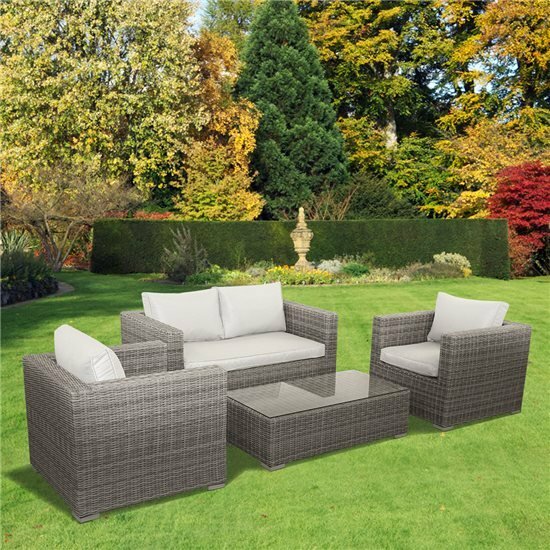 If you have the outdoor space for it, there is a rattan set available to meet the specific needs of you and your household. If you host a lot of barbecues, pool parties, outdoor gatherings, or holidays, an outdoor rattan set is an excellent option! Larger pieces of furniture are also available to choose from if youâ€™re looking for rattan sofas that seat at least six people or more. Many pieces of furniture are available in separate sections so you can move the pieces around or separate each section as you see fit. Conjoin each section or keep them apartâ€”the choice is yours. Additionally, rattan dining sets are a glamorous option for families who enjoy eating outdoors during the summer months. Eat outdoors, host an outdoor movie night with a nine-piece sofa set, or relax on an outdoor chaise lounge with a bottle of wine. With rattan furniture, the possibilities where comfort meets sophistication are limitless. If you already know that a set is what you need, you may be interested in rattan cube furniture. Cube furniture provides a sophisticated look and feel, particularly useful for a romantic outdoor dinner. Sets of cube furniture usually come in a square or rectangular table with a classy glass top. They come with matching chairs, which form a cube shape when pushed under the table. A variety of these unique sets come with footstools, which can also be stored under the table before pushing the chairs in. This style of rattan furniture saves you space, but also provides you with plenty of functional seating for outdoor use. 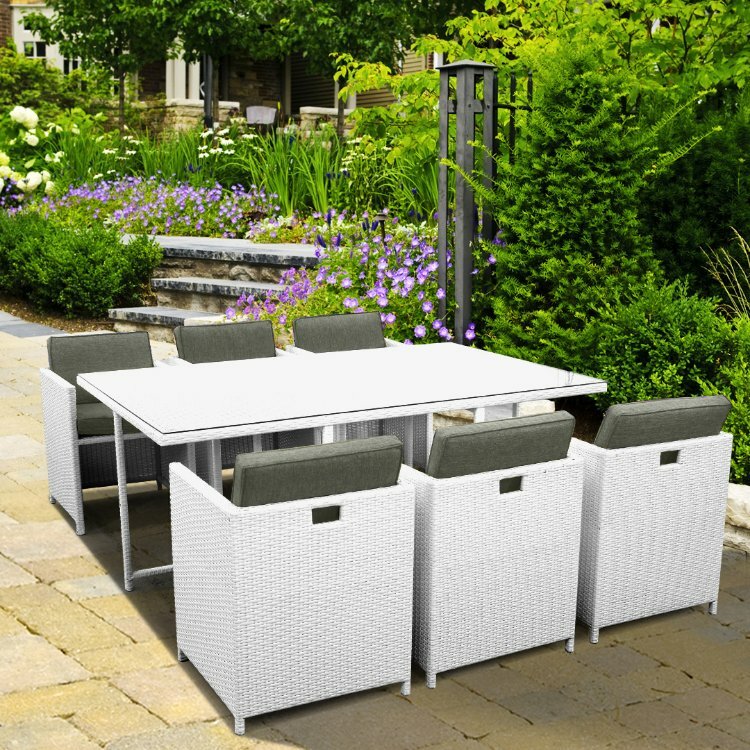 Most cube sets are made of synthetic rattan rather than natural rattan, so they can be left outside all year long. If the cube look isnâ€™t your style, then a traditional round shape may be more in line with what youâ€™re looking for. Traditionally, round furniture is a popular option for outdoor use and there are plenty of round styles available in rattan materials. Round rattan furniture is excellent when used near corners, outdoor nooks, or to be used as an outdoor focal point. Whether youâ€™re looking for a round dining table, couch, sectional sofa, or coffee tableâ€”options are available to meet any of your preferences and needs. Many round sets will form a full circle, which makes your outdoor space look absolutely stunning and put together. Circular day beds with or without an added canopy are another relaxing option for lounging outside near the pool, reading a good book, or catching a nap on a warm summer day. An outdoor day bed is something that the whole family will make use of all summer. Additionally, ottomans can also be purchased to provide additional seating or storage. 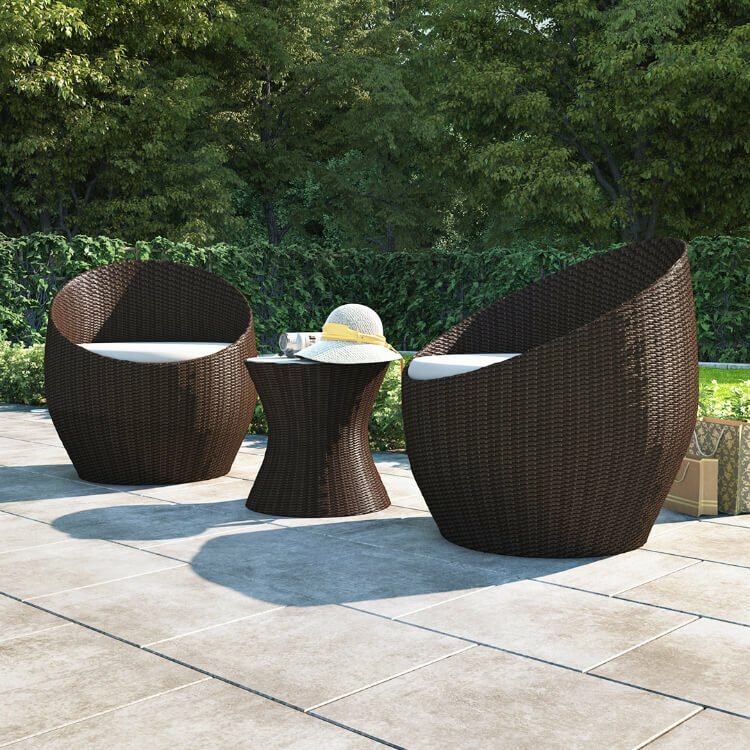 There is no question that egg styles are elegant, charming, and sophisticated furniture options for outdoor use. Whether used as a swing chair or hammock, egg style rattan furniture is a comfortable yet stunning option. Egg rattan furniture is created in the shape of an egg to be used as a comfortable place to relax and unwind. Swing chairs are created in the form of an egg and are suspended from a steel or aluminium post. They usually come with cushions for added comfort, and can even be purchased to seat two people at one time. This type of furniture serves the purpose as a hammock, but is often more expensive than a traditional hammock. However, they are more comfortable to sit on and tend to be safer as well. Many people agree that they are easier to get in and out of as well. Another piece of egg rattan furniture is similar to the cube furniture we mentioned earlier, except the table and chairs fold up to resemble an egg rather than a cube. This unique style takes up even less space than a cube. One of the great benefits of rattan is that you can purchase matching outdoor storage options, which isnâ€™t always the case when it comes to outdoor furniture. With rattan, you can choose from a variety of synthetic or natural options for a beautiful yet functional way to create more outdoor storage space. Since storage options also provide comfortable seating, guests will have no idea that the bench they are sitting on is actually holding books, magazines, pool supplies, or even snacks. If you need additional outdoor storage space, you may be interested in looking for an outdoor storage bench, which looks beautiful on the outside but opens up to expose space for storage. Alternately, deck boxes may also be purchased for storage space since they have the capacity to hold quite a bit of storage. Many have room to store more than 100 gallons of storage! Some deck boxes even lock for added protection. Deck boxes can also double up as additional seating Â if needed. Store your garden or pool supplies, sporting goods, or your childrenâ€™s toys in an outdoor deck box and ensure that they stay safe and tidy. Many deck boxes are even large enough to store your rattan cushions while they are not in use. If you donâ€™t need as much storage space as a deck box provides, stylish coffee tables with storage are also available for purchase. These are excellent for storing your grill or outdoor kitchen supplies. They can even be used to hold garden tools, cushions, or pet food. However, these tables are so wonderful that you may be tempted to bring them inside. Other storage items are also available in rattan or synthetic material, including trash bins, coolers, privacy screens, or hose reels. Since rattan garden furniture is so versatile, many neutral colours such as white, black, brown, or grey are available to choose from. These neutral colours tend to match any home or lawn area, so you never have to worry about whether or not they will fit the surrounding styles or colours in your yard. Black and brown are often the most popular colour choices among rattan furniture, but it all comes down to your own personal preferences. Black is always classy and modern, while brown offers a more natural look. Since brown is the natural colour of rattan, it is a great option for people who are looking for a natural or earthy look. On the other hand, grey is a great option for buyers who prefer a more weathered style. White is a classic style that always looks clean and attractive. One of the great benefits to rattan garden furniture is that you can purchase it in a neutral colour, and then personalise it with just about any coloured cushion. Change the cushions depending on the season, holiday, or time of year, or update the colours when you fancy a change. Personalising your furniture is easy and requires little time and effort. Some homeowners go with cushion colours that are more neutral and subdued, however, brighter, louder colours are also available. Whether you choose something like black, ivory, cream, tan, or grey. Or go for something louder like orange, lime green, turquoise, or red. In the past, many rattan users have enjoyed pairing white or black furniture with turquoise cushions. Grey rattan tends to pair well with black cushions while white on black, or white on white are other stylish options for personalising your furniture. You really canâ€™t go wrong when it comes to choosing the colours. While many sets come with cushions colours of your choice, you also have the option to purchase additional colours, styles, patterns, or designs. Choose from striped prints to paisley and go as wild or subdued as you choose. You may choose to go with colours that match your home or other furnishings, or go for something completely different. Since your cushions will be exposed to different types of weather, precipitation and strong sunlight, itâ€™s important that your cushions can withstand strong UV rays and moisture. High-quality pillows and cushions are usually made out of polyester and help to fight mildew, stains, mould, and water. The highest quality cushions and pillows will ensure that you are able to use your cushions for as long as possible without needing to replace them. As we discussed earlier, rattan garden furniture must be treated with care and delicacy in order to ensure that it lasts as long as possible. Rattan is very strong and durable, but it must still be cared for and given the proper attention it needs. In addition to gentle cleaning with dish soap and water, you should never drag your rattan furniture around. Since itâ€™s so lightweight and easy to carry, you should always lift the furniture to move it, but never drag. Dragging it can cause damage. In fact, you may even wish to add felt pads or rubber stoppers to the feet of your furniture to protect it from splintering or causing other damages. Although Rattan is highly durable it may dry out from heat damage if left out in the sun for too long. The natural moisture of rattan may become dry and brittle, leading to frays or breakage over time. Rattan canopies are available for purchase in order help to protect your furniture from the sun, but removable furniture covers can have a similar effect. They are usually easy to cover the furniture and remove as often as needed, and they protect your furniture from the sunâ€™s damaging rays. If your rattan furniture does fray or crack from prolonged exposure to the sun, you will need to re-coat it as quickly as possible. If you donâ€™t, the fraying will only increase over time and you may never be able to repair it. Instead, you would have to completely replace the furniture. To re-coat the furniture, make sure it is completely dry and then spray it with a waterproof lacquer. Additional moisture left on the rattan will result in more damage, so itâ€™s important that the furniture be completely dry before coating. Locations that get a lot of sun exposure can be great for sun tanning, growing certain crops, and for swimming in the pool, but they can also be damaging to your rattan furniture. When you live in an area that gets a lot of sunlight or rainfall, you may want to think about purchasing a cover. Additionally, covers are great for protecting your furniture from wet leaves or branches that may scratch or damage your furniture and its cushions. While many homeowners bring their furniture indoors during the cold, snowy winter months, others prefer to leave the furniture outdoors all -year-round. If you choose to keep your furniture outside in the freezing rain or snow, you must use a cover to protect the furniture, otherwise you will risk damaging the material. Covers are typically sold in colours of grey or tan, and they usually come in a variety of sizes and shapes to protect any shape or size. There are specific covers available to fit any type of furniture, even outdoor sofas, love seats, chaise lounges, chairs and more. Larger covers may also be purchased to cover more than one item at a time. Regardless of which type of furniture you own, there will be a cover available to protect it. 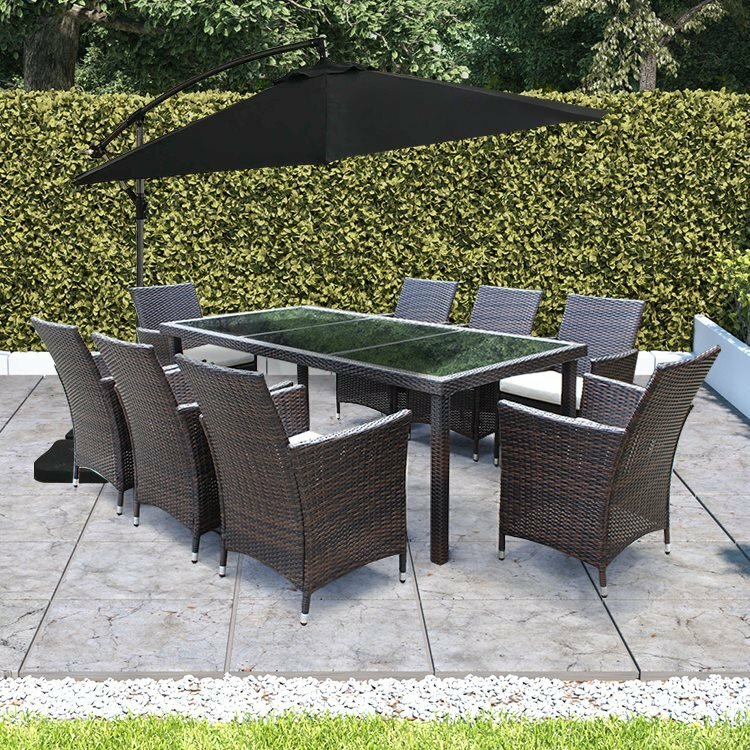 Polyester and vinyl are two of the more common types of materials used to protect rattan garden furniture since they are often treated with additional UV ray protection. However, itâ€™s best to purchase covers that are designed specifically as rattan covers to ensure that they provide the most amount of protection. Covers used specifically for rattan protection are often made from vinyl, since it is heavier and more durable than polyester. Covers typically come with straps that attach to the legs of the furniture to ensure that the cover stays on during windy weather conditions. Additionally, covers made for rattan feature a fleece material on the inside to keep the furniture from getting scratched. One of the greatest benefits to purchasing your rattan furniture online is that youâ€™ll be presented with many more options that usually arenâ€™t available in stores. Youâ€™ll also get the best prices and the highest quality products when you purchase rattan online. Before you purchase rattan, you can certainly browse furniture stores and test out furniture in person, but your best bet is to purchase the furniture online. There is more competition online, so youâ€™re going to be presented with the best options and the most competitive prices. Additionally, many stores only carry outdoor furniture during certain times of the year, but you can usually find rattan material online all year long. As we discussed earlier, there are many benefits to purchasing a rattan furniture set versus purchasing each piece of furniture individually. First of all, you save money when you purchase rattan in a set rather than not. Otherwise, each individual piece tends to cost more when purchased separately. When you purchase each piece of furniture individually, it can also become more difficult to find matching pieces later. The matching colour, style, or design you need, may be sold out or discontinued and then youâ€™re left finding something that matches as best as possible, but may not be a perfect fit. This is especially true when youâ€™re looking to add on additional chairs, ottomans, or storage boxes. Most sets are sold with furniture covers, which is a nice bonus. When you have a beautiful outdoor living area, you should have stylish but comfortable furniture to accompany it. Without it, you may not spend as much time outdoors as youâ€™d like to, especially during the spring and summer months. The more outdoor seating you have available, the more time you will spend outdoors with your family and loved ones. If youâ€™re looking for a durable furniture material that will last, rattan is the perfect solution to your outdoor living space. The unique design and beautiful style of rattan will appeal to you and all of your guests, providing comfortable seating that is also fantastic to look at. With so many styles, colours, and options to choose from, who can resist the appeal of rattan furniture? You shouldnâ€™t have to sacrifice comfort for stylish outdoor furniture that feels stiff and uncomfortable. With rattan, you really do get the best of both worlds.